Did you ever wonder how the Bible became such an essential part of being a Catholic in our Day? Dei Verbum—The Dogmatic Constitution on Divine Revelation—remains one of the foundational teachings of the Second Vatican Council. Discover how this teaching helped to move the Bible into the heart of parish faith formation, and continues to direct our efforts in liturgy, education, and spirituality. Appropriate for all parish adult faith formation efforts, Bible study groups, and diocesan education programs. Father Ronald Witherup, PSS, has done a valuable service for priests, pastoral ministers, catechists and the church in general with the publication of The Word of God at Vatican II: Exploring Dei Verbum. . . . 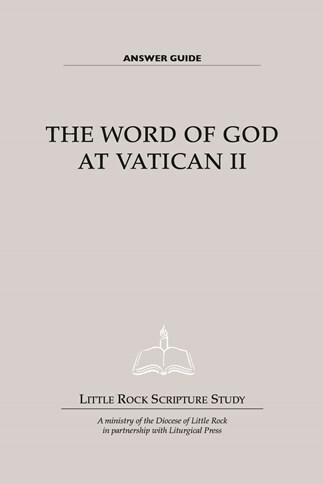 Accompanying the volume is The Word of God at Vatican II Study Guide developed by Little Rock Scripture Study. The [study] guide has four sessions and is a fine resource for adult faith formation classes, RCIA, Bible study groups and diocesan education programs.